Spring Beauty, Claytonia virginica, is in the family Portulacaceae and was named for John Clayton (1686-1773) who was Clerk to the County Court of Gloucester County, Virginia from 1720 until his death. He has been described as the greatest American botanist of his day and was one of the earliest collectors of plant specimens in that state. The name says it all. It is truly a beauty in spring with its pink-striped flowers. One plant doesn't make much of a splash, but it seeds itself in such profusion to create carpets of pink. Last spring in my yard it covered an area of 6-8 square feet. It is a delicate, fragile-looking beauty which belies its true nature. In prior years I have spotted the grass-like leaves of Spring Beauty in late January, but never as early as December 10th. By the end of March, it is all budded up waiting for a warm sunny day to open its flowers. From then into May it makes a delightful sight wherever it has chosen to grow. It is a small plant growing only three to six inches tall with both basal leaves and a pair of narrow leaves on the stem. 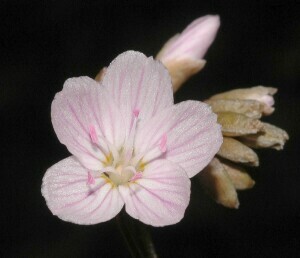 The stem terminates in a raceme of small flowers, consisting of five petals that are white with fine pink stripes that vary in intensity. On cloudy days the stem droops and the flowers close only to open again on another sunny day. Sunny days bring out the pollinators - all sorts of bees and Claytonia virginica flies and occasional butterflies. 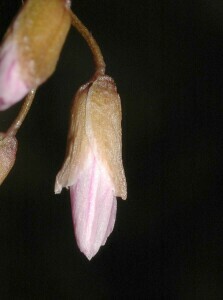 The flowers when fertilized produce a capsule containing a few seeds. By the end of May it has formed and dispersed its seeds, stored up enough energy for the next year, decides it doesn't like hot weather and bids a fond adieu. Like other spring ephemerals - Dutchman’s’ Britches, Squirrel Corn and Virginia Bluebells, it takes advantage of the leafless trees in spring to complete its above ground growth. As with spring bulbs one must be careful when digging around them. Another common name is Fairy Spuds, derived from the small spud-like edible corm. Fernald and Kinsey in their "Edible Wild Plants of Eastern North America" state that when boiled in salted water are palatable and nutritious, having the flavor of chestnuts. 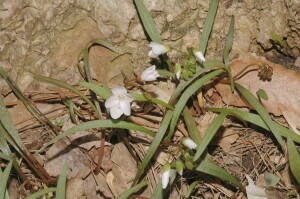 They further state that the succulent Claytonia virginica young plants are a possible potherb. The Algonquins ate the cooked corms like potatoes. I have not tried it, but maybe I will this spring. The Iroquois used a cold infusion of the roots as an anticonvulsive for children. The raw plants were also used as a contraceptive.